Integrity means living by the values we cherish, even when they are challenged. 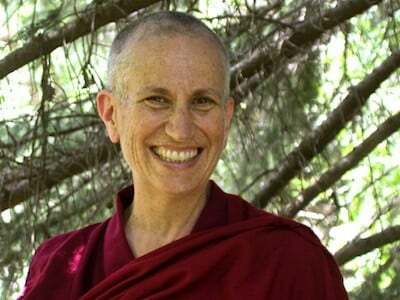 Venerable Thubten Chodron offers heartfelt wisdom on why we should never lose hope, even in trying times. With a realistic perspective, we can stand up for what we believe in and as we seek to put our principles into practice. This is Ven. Chodron’s annual autumn talk at North Idaho Community College. The theme is exploring racial diversity and ethnicity, and the college is reading a book about racial inequity in the US justice system, Just Mercy by Bryan Stevenson. Read the NY Times review. 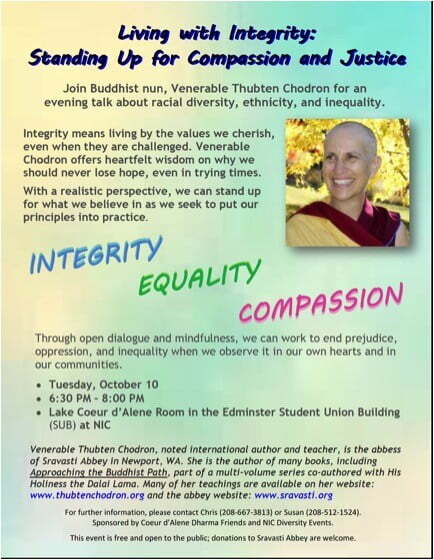 Talk will be held in the Lake Coeur D’Alene Room, Edminster Student Union. For more information, contact Laura at (208) 660-5477 or email latempleman@nic.edu.